it is unrevealed whether he has any other career, though Amanda Sefton referred to him as a "weekend warrior"
Powers/Abilities: Angus Graham was highly skilled at the art of fencing; he was considered A-rated and a force to be reckoned with. He was also a good sport, maintaining friendly competition. (X-Men: Soul Killer chapter 2 (fb) - BTS) <Three years prior to the main story> - Angus Graham was the Scottish national fencing champion. (X-Men: Soul Killer chapter 2 (fb) - BTS) - Angus was known to compete at fencing tournaments throughout Britain. (X-Men: Soul Killer chapter 2 (fb) - BTS) - Sparring at the Edinburgh Open, Angus faced off against Kurt Wagner (aka Nightcrawler of the X-Men). Using an image-inducer to appear like a normal human, Wagner did not use his teleportational or wall-climbing abilities (or his tail); as he did not utilize superhuman abilities beyond his own training and skills, Wagner considered competing against normal people fair. (X-Men: Soul Killer chapter 2) - Advancing down the copper fencing strip with crisp steps, his knees deeply flexed, Angus smiled confidently behind the wire mesh of his mask. When Wagner let his arm droop, exposing his wrist and encouraging his opponent to take a shot, Angus seemingly took the bait. However, when Wagner spun his epee in a circle-six parry, Angus disengaged, evading the defensive action, and then continued on, driving his point toward its target. Wagner frantically hopped backward and parried again, barely catching Angus' weapon and sweeping it safely aside. Wagner then whipped his arm, his blade bowed, and his point flicked down, catching Angus on the white nylon sleeve of his jacket. As the buzzer brayed, the director confirmed the touch and declared Wagner the victor. 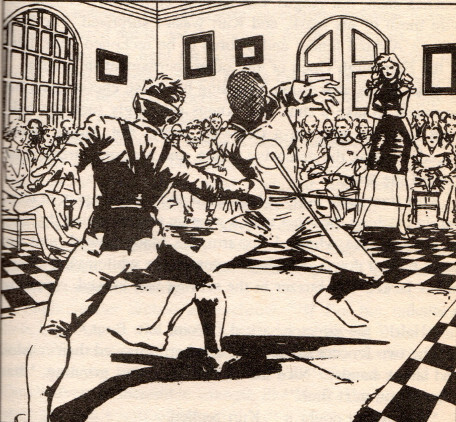 The two fencers saluted each other, removed their masks, and shook hands. Grinning, Angus told Wagner, "Nice match, but I'll get you next time." Wagner acknowledged that he wouldn't doubt it. Comments: Created by Richard Lee Byers and Leonard Manco. In the above image, Graham is likely the one in the background/upper right. That's presumably Amanda Sefton in the upper right.